Inoways was the pioneers in development of the more stable, long-lasting max-fx type collapsible banner stands which tensions the graphics from both sides evenly. 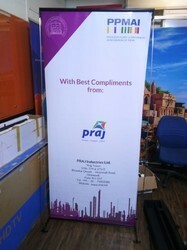 Inoways offers Maxefx Foldable Banner Stand, in line with international standards. Your brand, business and project are always at the heart of our thinking, which is why we provide exclusively designed and custom-fabricated exhibition booths. we also recommend, create and install exhibition stands according to client requirements not only this, we are also well known for our self-engineered promotional displays, foldable banner stands, modular platforms, flat frame podiums/backdrops, display fixtures, and foldable counters.our success lies in the cumulative efforts of competent and skilled team members, who meet all the practical constraints of the client in terms of space, size and budget with a personalized approach. it is this commitment and focus that brings us industry-wide accreditation. Inoways was the pioneers in development of the more stable, long-lasting max fx type Portable Exhibition Standee, which tensions the graphics from both sides evenly. Looking for Collapsible Banner Stands ?